The ability to concentrate is one of the most important skills children need to succeed in school. 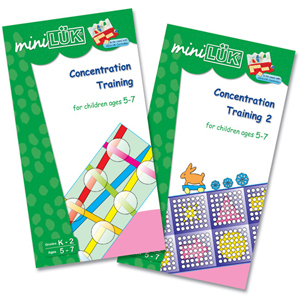 These two workbooks provide exercises to strengthen children's ability to focus, to stay on task, to increase their attention spans, and to enable children to process information more quickly. As a result, children become more efficient and effective learners while having fun. The ability to concentrate is one of the most important qualifications for children?s success in school. Often children who have difficulty concentrating also have problems learning. These exercises help children improve their general concentration ability and develop problem solving strategies in an enjoyable way. As a result, they become efficient and effective learners. The following developmental skills are covered in this workbook: concentration, visual perception, memorization capability, and problem solving skills. The ability to concentrate is one of the most important skills needed for children to succeed in school. Often children who have difficulty concentrating also have problems learning. These activities provide essential exercises for children to strengthen their ability to concentrate, to develop various problem solving strategies, and to process information more quickly. As a result, children become efficient and effective learners while having an enjoyable experience. Visual perception, memory training, and the abilities to associate, to focus, and to stay on task are all covered in this workbook.